One of the first techniques you learn as a cook in any kitchen or culinary school, other than product knowledge and food safety, is knife handling. How to safely use a knife, clean a knife, sharpen a knife, and eventually how to obtain consistent knife cuts always. You all should know by now that a dull knife, is a dangerous knife. 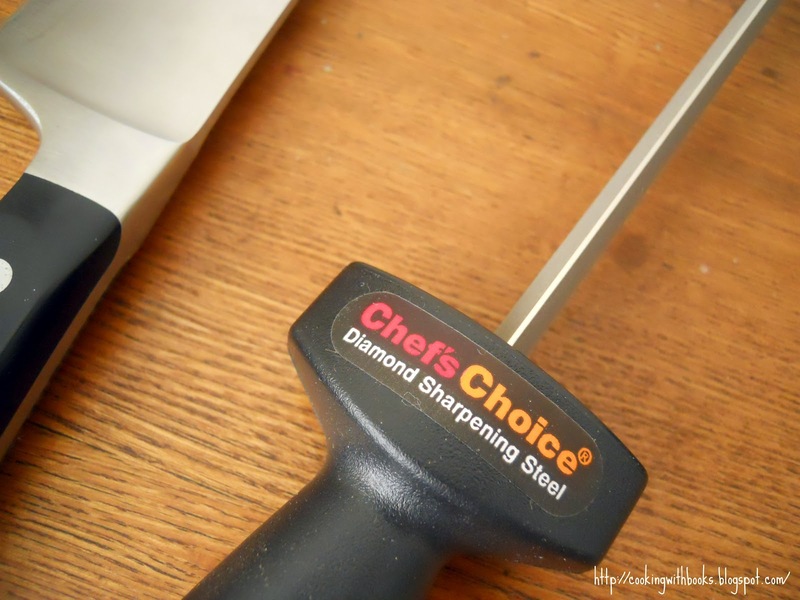 One of the fastest and easiest thing is to sharpen your knife (and keep it honed) as needed.Thanks to Big Kitchen Store, I review the Chef’s Choice Diamond Hone Sharpener 310. Click here to discover even more Big Kitchen products! Make sure your’re sharpening a clean knife. Dry off any excess moisture. Place the blade against the blades. You’ll feel the magnetic edge place the blade into place. Repeat on both side. Now it’s time to hone with a steel. One of my favorite details of this sharpener is that when suctioned in, it will not move. 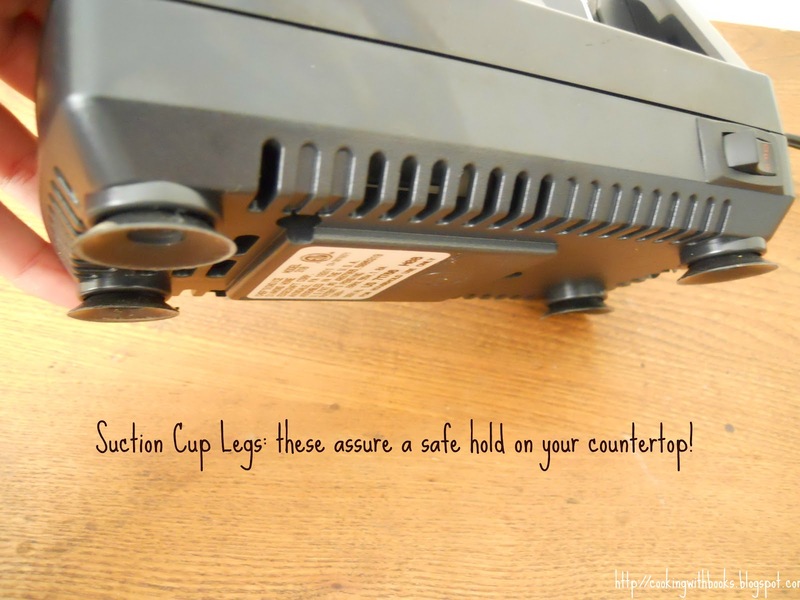 A must have safety feature! Make sure you have plenty of room around you. Hold the steel by place ALL your fingers below the guard. Draw the blade across the steel, so that every part of the blade gets honed. Keep the knife blade at a 20 degree angle to the steel. Use light stokes, placing even pressure as you go down the steel. Not doing so could create a curve in the blade. Wash your knife and remove all residue. Chiffonade: a fine slice of herbs and leaves, Chiffonade is a delicate knife cut that is easily achieved and often used as a garnish. For large leaves such as spinach or large herb leaves, such as basil, remove stems and place leaves one on top of the other. Roll into cylinder and cut using thin, parallel motions.You can use this technique on doughs as well, as you can see in the picture. 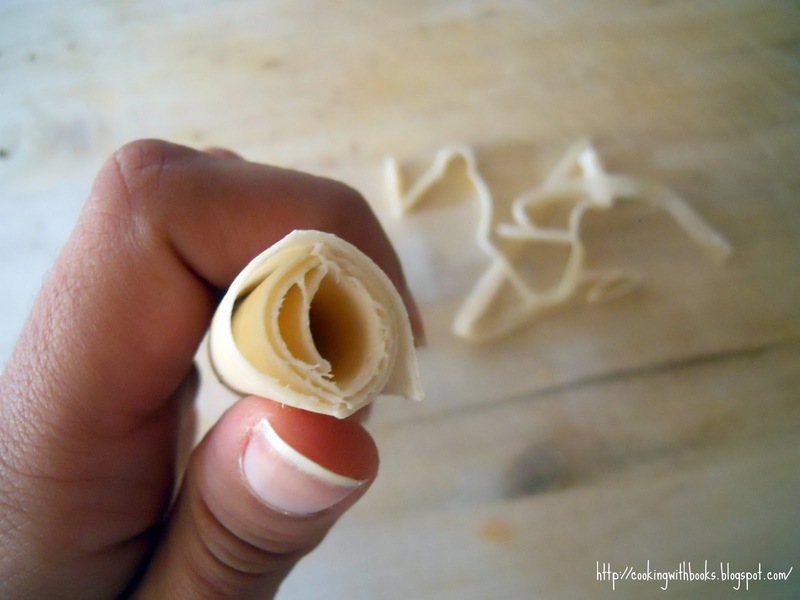 Wonton papers, rolled up, sliced and made into thin strips, which can later on me deep fried and used as a crispy salad topping. Batonnet: the knife cut you want to use when making fries or roasting perfectly sliced veggies. 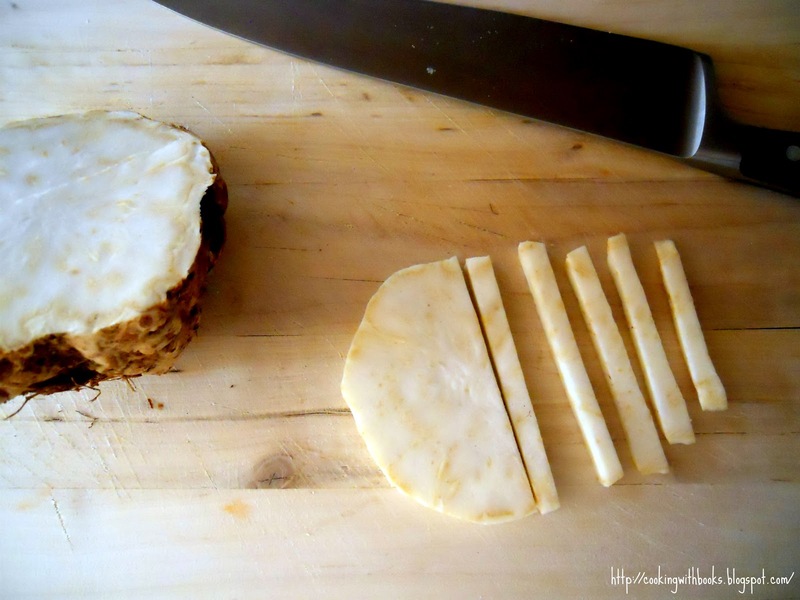 To cut a potato into batonnet, peel and cut ends and sides until you have a rectangular block, making four straight sides. This will result in even, perfect cuts. Slice lenghtwise and then stack the slices. Cut the same thickness for batonnet. Use the scraps in soups, stocks, and purees. Small, Medium, & Large Dice: after cutting batonnet and depending on the size needed, just line up the sticks and cut into dice. Great for roasting, sauteing, and frying! Enter to win! Hone your sharpened knives by winning a 10” steel from Big Kitchen Store. To enter, visit Big Kitchen and comment telling me what kitchen item you need the most in your kitchen. The comments are the official entry, there is no purchase necessary, void where prohibited. US mailing addresses only. One (1) winner will be chosen randomly. Prize will be shipped by Big Kitchen. The contest ends Sunday, March 4th, 2012 at 11:59 pm Eastern. The winner will be announced on Monday, March 5th via email and will have 48 hours to respond before a new winner is chosen. Disclaimer: Big Kitchen Store facilitated this review by sponsoring it with a knife sharpener and steel free of charge. As always, opinions are based on personal testing. Do I have to pick just one thing? There is so much I would love to have, but some new saute pans would be nice! I could so use some new cookware. After 28 years my set has pretty much had it!! 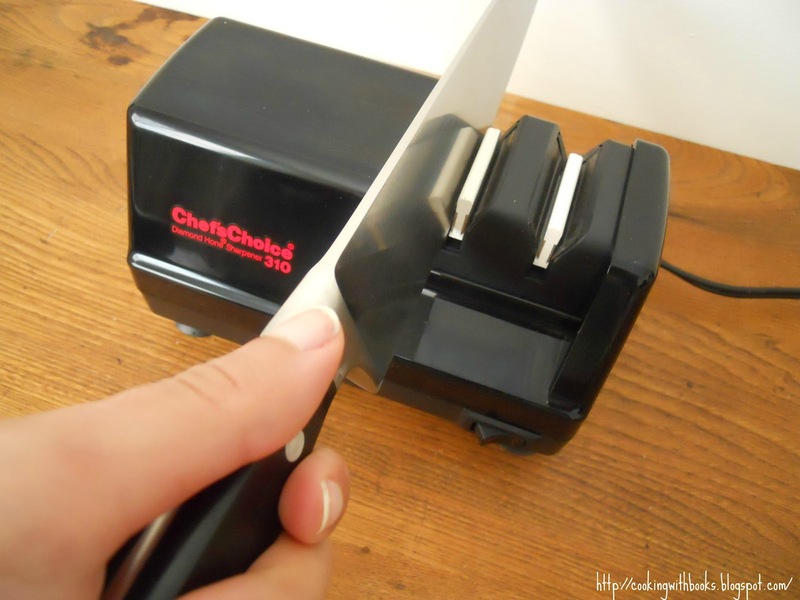 If I had this knife sharpener then all my knives would be in better shape so I would love to win! I need (or at least WANT oh so bad) one of the indoor grill pans. I see them on the cooking shows and covet them. Nice information on the cuts! :-) I don’t have a US mailing address,so I will notify friends who do have one,to take enter the giveaway. I would LOVE a new Kuerig Machine. I love the one I have but its on its last legs — we drink lots of coffee round’ here. I really need a cookie sheet, it’s nice to see they have a stainless steel one! That’d by my choice! That is one fantastic website, Marnely! (Bookmarked it for further “wish list” compiling…!) I’ve always been cautious using knives (probably because I play the piano), so I appreciated your knife skills how-to. (My hubby sharpens them for me!) I really need a new set of steak knives — grilling season has begun! I have some awesome knives, but no sharpening tool! I take my knives to Serbia to have my neighbor work magic with them:) I would love to be able to sharpen my tools here in the U.S. I can never have enough steels…they are the most popular item in the kitchen! I need to sharpen my knives & find a good set. Thanks for the review! I have a bunch of knives that could use sharpening. A new toaster oven would be nice too! I really need new knives, I only have old cheap ones. You’re a pretty sharp cook! And don’t enter me in the contest, either. I don’t need a steel. I’ll just steal one from Rachel. I really need a good knife sharpener. All my knives are so dull. i didn’t know that’s how you made chiffonades, hehe thanks for the tutorial! i think i need a small cutting board, since its so much work to take the big one out just to cut something small. the bamboo ones look good! I spent an hour picking out new knives, my first “real knives”, having used only $10 plastic handled knives before. I got to chop onions and potatoes at the store, and it was great fun! I was thinking I’d only use the steel myself, then when sharpening was needed take them somewhere… but this sharpener looks foolproof, I may look at it! Interesting to see these gadgets & tools for sharpening knives. The last I remember from back home was this slab of some kind of stone on which my mom used to rub the knife to sharpen its blade. We’ve dropped our good knives off at a sharpening place before… otherwise, I do try to use the steel but I’m not good at it. I need a sharp knife. That’s what I need. Oh and I need everything else they sell! Yum!